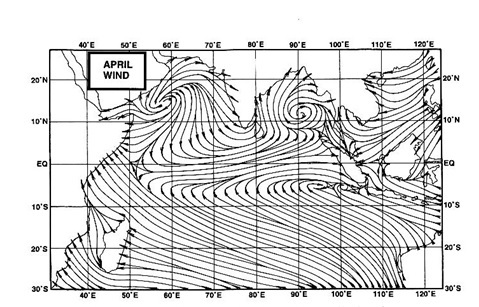 Mumbai can expect Cloudy weather on Saturday 20th, with light drizzles in some parts of city or in the vicinity. More likely drizzles in Northern outer townships. Pune will be cloudy and warm. Hot summer like 37c expected on Sunday, from Friday's 33c. Delhi was warm on Friday as predicted, with S'Jung rising to 29.8c and it was 32.8c at Gurgaon. Several regions of Rajasthan, Punjab and Haryana had some rain on Friday. Kashmir and HP had rain/snow, with Srinagar being at a high of 12.5c. The contest results are now nearing, with 40c just a few days away....On Friday, Bhubaneshwar has managed 39.3c, and Angul has suddenly shot up to 39.1c.Nizamabad was 38.8c. Cannur was 38.8c....Another candidate i would not rule out is Akola. Akola shot up to 38.4c on Friday. 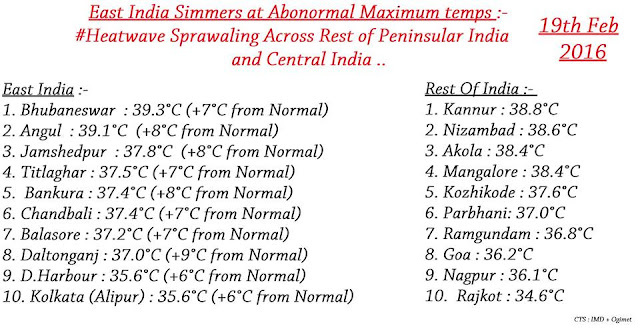 Mangalore, Panji(Goa) & Rajkot temp mention in above table is of yesterday !! Yeah... I think we have to be careful about the dates here. Normally if we look at the temp data from IMD website at around 1400 IST, we should have the max temp for the 24 hrs ending 0830 of the same day. However, IMD starts updating the max temps for the next 24 hrs by nighttime. So, some of the max temp data we see at say 2200 IST will be for the 24 hrs ending 0830 next day. Bhuvneshwar at 11.30 am was 37.4℃. 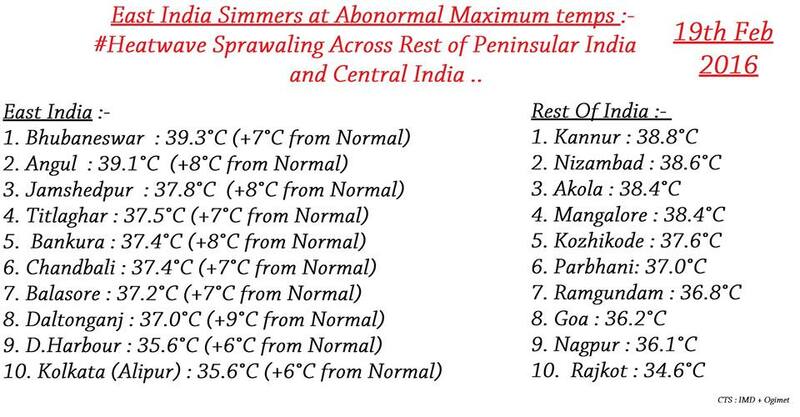 So Bhubaneshwar it is then.... 40.1°C on 20 Feb 2016.